Cinco De Mayo Recipes with Eric Ripert. Plus His Contest. 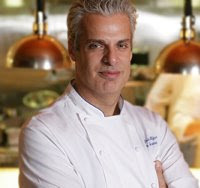 Any foodie knows who the Michelin Star awarded chef Eric Ripert is. He leads the fabulous team at Le Bernardin in NYC. From watching Eric on foodie/chef TV shows like Top Chef and No Reservations, you can easily get a sense of how incredibly skilled a chef and warm and 'cool' a person he is. And Eric's website rocks. My Le Bernardin Experience. I dined there last year and was pleasantly amazed when Eric's kitchen or wait staff didn't blink an eye when I requested an all vegan meal. It was one of the best vegan meals I have ever had. Vegan salad on seasonal fresh ingredients, amazing vegan pasta and marinara sauce, mushrooms and even some amazing sorbet. My husband enjoyed his "Surf 'n Turf" non-vegan dish immensely as well. Le Bernardin is a spot-on special occasion restaurant. It made me an Eric Ripert super fan. My Veganized "Eric Ripert" Cinco De Mayo Menu. I already posted my delicious recipe for a similar recipe. You can use my recipe, or go with Eric's. Veganized: Citrus Braised Tofu with Chilled Citrus Cilantro Mango & Pineapple Slices. Eric's shrimp dish is a citrus marinated cold dish. Shrimp is a protein, so I wanted to keep slightly in tune with Eric's menu flow. Same! No need to veganize! This recipe is 100% vegan and sounds delicious. 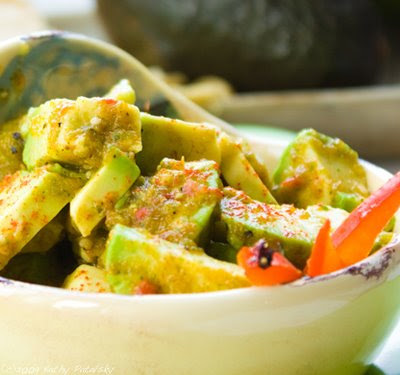 A bit of spice, a touch of tequila and a lot of healthy flavor! We love jicama! Another easy one! Eric's recipe sounds delicious. So all we need to do is substitute the steak with seitan-a very similar protein in texture. This one sounds divine and flavorful. 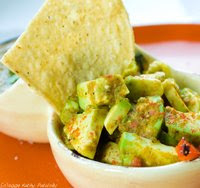 Perfect with some of the salsa verde guac. This one is actually pretty easy. You can either bake your our vegan shortbread cookies or simply buy some at a place like Whole Foods. Then simply add in some vegan vanilla soy cream. I think it would be fabulous to mix in some agave and cinnamon into the soy cream before smushing it between the cookies for a sandwich. Yum. Cocktail: The Guava-Agave Cooler, vegan and sounds divine. Yippee. So those are my Veganized versions of Eric's suggested Cinco De mayo Menu.